It is nearing the end of August now and although the days have been cooler around here, the sun is still super hot. My children are still spending a lot of time in the pool and I am trying to be vigilant with the sunscreen. This past summer, I put sunscreen on my oldest son before he went into the pool but was shocked when he came back in the house later. I took off his T-shirt (it wasn't a swim shirt, just a regular t-shirt) and to my horror, his entire back was sunburned. The sun totally went through his shirt and burned his back. Now, when he goes into the pool I always put sunscreen on his entire upper torso, back and front. That skin is so sensitive, it is important not to neglect it when applying sunscreen. 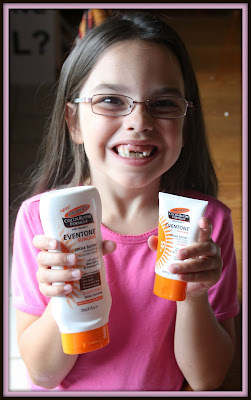 When I was asked about reviewing some of Palmer's NEW Eventone Suncare products, I was very excited. We are still using sunscreen around here and I knew I would love this new line. 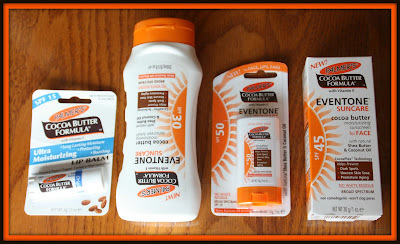 So, for this review I was sent the Palmer's Eventone Suncare Cocoa Butter Sunscreen Lotion, Sunscreen Stick, Lip Balm and the Face Sunscreen Lotion. Each of these bears the recognizable Palmer's logo so you can be sure you will spot it on any store shelf. Each of these products contains Cocoa Butter, which really helps with skin moisturization. I remember back when I had horribly dry hands and using cocoa butter was soo wonderful, my hands felt pampered and soft. When applied to the skin in this sunscreen, it does the same thing with the added benefit of protecting your skin from the sun. Included in my products was a sunscreen formulated especially for your face, which is great. Always make sure you cover your nose and ears too, they get hit hard with the sun. The sunscreen for face retails for $7 for 1 fl. ounce. 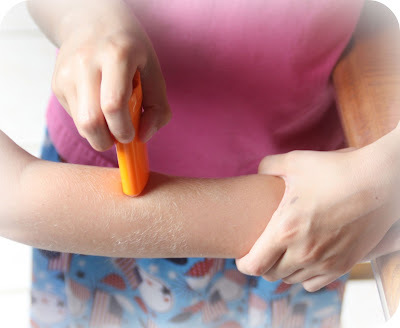 The lotion is super easy to apply, absorbs quickly and leaves no greasy residue. My daughter applied a good amount to her arms and it stayed put for quite a while, even after being in the pool. This sunscreen lotion is SPF 30, and will give you good sun protection for up to 80 minutes. Retail price on this is $7 for 8.5 ounces. Ok. So we really really REALLY love lip balm around here. I cannot keep any to myself, I always end up sharing. 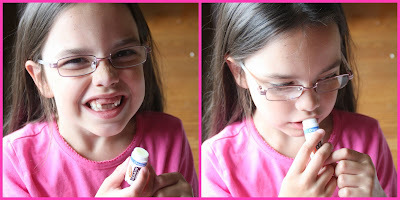 I am not sure if it is because of how good it makes your lips feel or just the idea that they get to put something on their lips but my children love using lip balm of any kind. I LOVE this Cocoa Butter Lip Balm. It goes on smooth, and really moisturizes my lips nicely. It is SPF 15 so you do get sun protection when you wear this outdoors. The lip balm from Palmer's retails for $1.95. Last but not least, my favorite. I LOVE sunscreen sticks and this one is no exception. 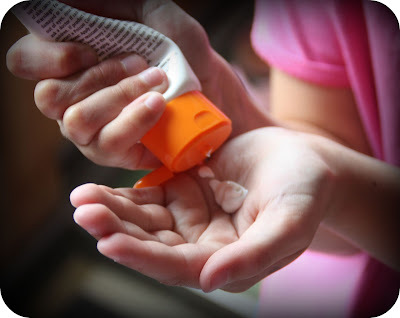 Sunscreen sticks are revolutionary simply because you don't get a sloppy mess on your hands. You don't even touch the sunscreen once it is applied. You run the stick up and down your skin and that is it! Sunscreen is applied. This stick is compact enough for your purse, glove box or diaper bag and works quickly especially when you are trying to get the children ready for the sun while you are out and about. No mess, no fuss...that is my kind of sunscreen. This sunscreen stick retails for $4. 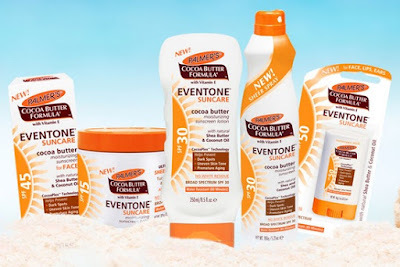 So, my overall opinion of Palmer's hasn't changed one bit after reviewing their new suncare line. I think that it is great that they are utilizing cocoa butter in their sunscreen and that it really helps your skin to feel soft and smooth, all while protecting your skin. I would definitely recommend this company and their products to all of my readers! Please check out Palmer's on Facebook as they are having some really neat giveaways going on right now and also, follow them on Twitter! Disclaimer: I received no monetary compensation for this post. I did receive free Palmer's products for review purposes. All quotes and stock photos are from the Palmer's website, Facebook and email. Prize is being provided and shipped by the sponsor. This blog is not responsible for lost, stolen or damaged prizes. All thoughts and opinions are 100% mine. I'd love to try the Original Ultra Moisturizing Lip Balm. I've always liked Palmer's cocoa butter formula. I would like to try Cocoa Butter Formula Skin Therapy Oil Spray. Visited and I would like to try the firming butter. I also like their lip balm. Thank you! i would really like to try the Palmer's Hand & Body Clinical Intensive Relief Hypoallergenic Lotion. I'd like to try the co wash cleansing conditioner. I would love to try the Palmer's Curl Shampoo. I'd like to try their Skin Therapy Oil Spray. I would love to try Olive Oil Anti-Dandruff Scalp Scrub Shampoo. Olive oil products always smell so good! I want to try the Tummy Butter Stretch Marks Cream. The cocoa butter would have been nice. I'd like to try the Original Ultra Moisturizing Lip Balm. I would like to try the Clean Scent Dry Shampoo. Like to try the . I would love the COCONUT OIL FORMULA Repairing Conditioner. I would love to try Palmer's Hand & Body Clinical Intensive Relief Hypoallergenic Lotion.